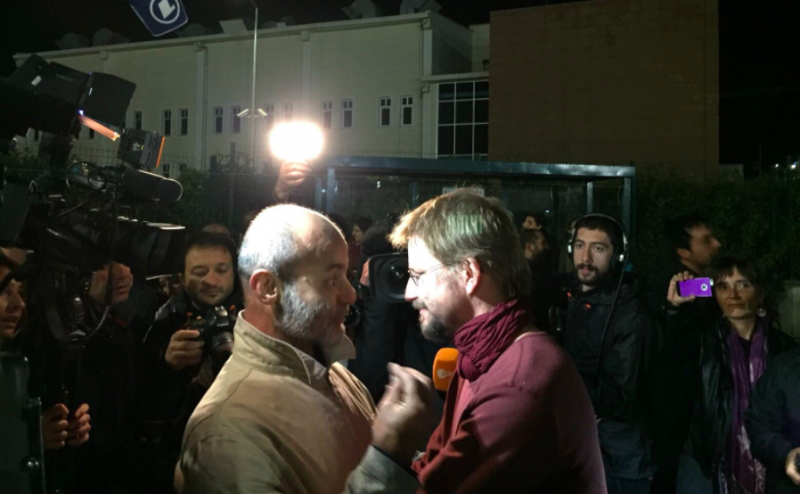 Nejat Tastan and Peter Steudtner embrace among a crowd of media and supporters, following their release. Photo shared by Fotis Flippou on Twitter. It was a long day in court for the Istanbul 10  on October 25, but one that ended with joy. Ten human rights defenders — including Amnesty International Turkey director Idil Eser — appeared in court on accusations of membership in a terrorist organization, after spending nearly four months in jail . The proceedings began at 10 a.m. local time, and ended around midnight with the release of all 10 defendants, pending trial. Veli Acu, who works with the Human Rights Agenda Association , and Ozlem Dalkiran, who works with the Helsinki Citizens Assembly , were issued mandatory travel bans  as part of their conditional release. The remaining eight defendants were released without condition, pending trial. Amnesty International Turkey chair Taner Kilic remains in pre-trial detention due to a separate case against him. His case was heard in Izmir on October 26, the day after the trial of the Istanbul 10, and despite the previous day's decision, the judge ruled  to continue his pre-trial detention. Turkish authorities say case has nothing to do with @Amnesty . But, as Idil now explaining, all evidence against her relates to our work. #NalanErkem : I had gastric bleeding. After arrest couldn't access treatment for 2 months. Bleeding went on for 2 months. Today, finally, we celebrate that our friends and colleagues can go back with their loved ones and can sleep in their own beds for the first time in almost four months…Tonight we take a brief moment to celebrate, but tomorrow we will continue our struggle. In an emotional statement  outside the courtroom speaking to a group of journalists, German citizen Peter Steudtner thanked everyone for their support. “I am grateful, we are all really grateful,” said the stress management trainer. In total, the group spent 113 days behind bars . As the news of their release circulated, friends and colleagues joined the celebrations online. The pro-government Turkish media — that has previously been quick to accuse rights defenders of connections to terrorist organizations — were largely quiet on the day of the trial and immediately after. For now, the Istanbul10 have been released from jail and are reunited with their loved ones. In advance of their next court appearance on November 22, Global Voices calls for all charges to be dropped unconditionally, and for Taner Kilic to be released.